Basis of trigonometry: if two right triangles have equal acute angles, they are similar, so their side lengths are proportional. Proportionality constants are written within the image: sin θ, cos θ, tan θ, where θ is the common measure of five acute angles. In mathematics, the trigonometric functions (also called circular functions, angle functions or goniometric functions) are real functions which relate an angle of a right-angled triangle to ratios of two side lengths. They are widely used in all sciences that are related to geometry, such as navigation, solid mechanics, celestial mechanics, geodesy, and many others. 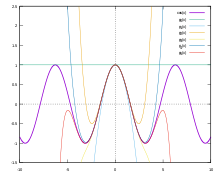 They are among the simplest periodic functions, and as such are also widely used for studying periodic phenomena, through Fourier analysis. 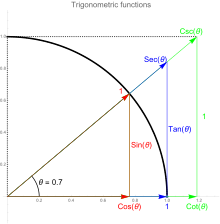 The most familiar trigonometric functions are the sine, the cosine, and the tangent. 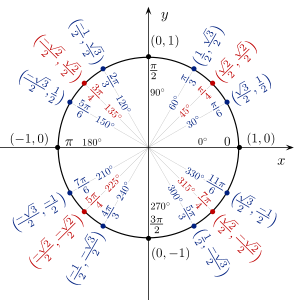 Their reciprocal are respectively the cosecant, the secant, and the cotangent, which are less used in modern mathematics. 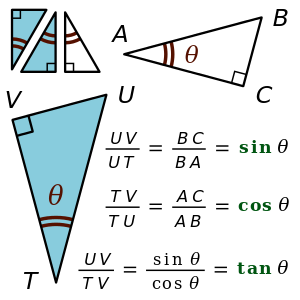 The oldest definitions of trigonometric functions, related to right-angle triangles, define them only for acute angles. For extending these definitions to functions whose domain is the whole projectively extended real line, one can use geometrical definitions using the standard unit circle (a circle with radius 1 unit). Modern definitions express trigonometric functions as infinite series or as solutions of differential equations. This allows extending the domain of the sine and the cosine functions to the whole complex plane, and the domain of the other trigonometric functions to the complex plane from which some isolated points are removed. In this section, the same upper-case letter denotes a vertex of a triangle and the measure of the corresponding angle; the same lower case letter denotes an edge of the triangle and its length. Given an acute angle A of a right-angled triangle (see figure) the hypotenuse h is the side that connects the two acute angles. The side b adjacent to A is the side of the triangle that connects A to the right angle. The third side a is said opposite to A. In geometric applications, the argument of a trigonometric function is generally the measure of an angle. For this purpose, any angular unit is convenient, and angles are most commonly measured in degrees. When using trigonometric function in calculus, their argument is generally not an angle, but rather a real number. In this case, it is more suitable to express the argument of the trigonometric as the length of the arc of the unit circle delimited by an angle with the center of the circle as vertex. Therefore, one uses the radian as angular unit: a radian is the angle that delimites an arc of length 7000100000000000000♠1 on the unit circle. A complete turn is thus an angle of 2π radians. A great advantage of radians is that many formulas are much simpler when using them, typically all formulas relative to derivatives and integrals. This is thus a general convention that, when the angular unit is not explicitly specified, the arguments of trigonometric functions are always expressed in radians. 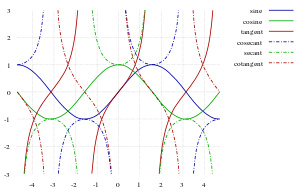 In this illustration, the six trigonometric functions of an arbitrary angle θ are represented as Cartesian coordinates of points related to the unit circle. The ordinates of A, B and D are sin θ, tan θ and csc θ, respectively, while the abscissas of A, C and E are cos θ, cot θ and sec θ, respectively. radian (90°), the unit circle definitions allow to extend the domain of the trigonometric functions to all positive and negative real numbers.
. The coordinate values of these points give all the existing values of the trigonometric functions for arbitrary real values of θ in the following manner. hold for any angle θ and any integer k.
The unit circle, with some points labeled with their cosine and sine (in this order), and the corresponding angles in radians and degrees. provides an easy way to remember the values. Such simple expressions generally do not exist for other angles which are rational multiples of a straight angle. For an angle which, measured in degrees, is a multiple of three, the sine and the cosine may be expressed in terms of square roots, see Trigonometric constants expressed in real radicals. 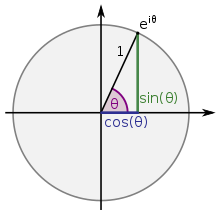 These values of the sine and the cosine may thus be constructed by ruler and compass. For an angle of an integer number of degrees, the sine and the cosine may be expressed in terms of square roots and the cube root of a non-real complex number. Galois theory allows proving that, if the angle is not a multiple of 3°, non-real cube roots are unavoidable. The following table summarizes the simplest algebraic values of trigonometric functions. 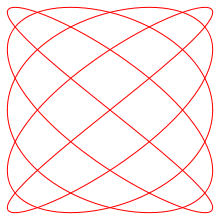 The symbol ∞ represents the point at infinity on the projectively extended real line; it is not signed, because, when it appears in the table, the corresponding trigonometric function tends to +∞ on one side, and to –∞ on the other side, when the argument tends to the value in the table. 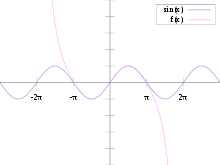 For defining trigonometric functions inside calculus, there are two equivalent possibilities, either using power series or differential equations. These definitions are equivalent, as starting from one of them, it is easy to retrieve the other as a property. However the definition through differential equations is somehow more natural, since, for example, the choice of the coefficients of the power series may appear as quite arbitrary, and the Pythagorean identity is much easier to deduce from the differential equations. The radius of convergence of these series is infinite. Therefore the sine and the cosine can be extended to entire functions (also called "sine" and "cosine"), which are (by definition) complex-valued functions that are defined and holomorphic on the whole complex plane. for the cotangent and the cosecant, where k is an arbitrary integer. Recurrences relations may also be computed for the coefficients of the Taylor series of the other trigonometric functions. These series have a finite radius of convergence. Their coefficients have a combinatorial interpretation: they enumerate alternating permutations of finite sets. This formula is commonly considered for real values of x, but it remains true for all complex values. One can also define the trigonometric functions using various functional equations. These identities can also be used to derive the product-to-sum identities. The derivatives of trigonometric functions result from those of sine and cosine by applying quotient rule. The values given for the antiderivatives in the following table can be verified by differentiating them. The number C is a constant of integration. In this sections A, B, C denote the three (interior) angles of a triangle, and a, b, c denote the lengths of the respective opposite edges. They are related by various formulas, which are named by the trigonometric functions they involve. The explanation of the formulae in words would be cumbersome, but the patterns of sums and differences, for the lengths and corresponding opposite angles, are apparent in the theorem. While the early study of trigonometry can be traced to antiquity, the trigonometric functions as they are in use today were developed in the medieval period. The chord function was discovered by Hipparchus of Nicaea (180–125 BCE) and Ptolemy of Roman Egypt (90–165 CE). The terms tangent and secant were first introduced by the Danish mathematician Thomas Fincke in his book Geometria rotundi (1583). The first published use of the abbreviations sin, cos, and tan is probably by the 16th century French mathematician Albert Girard. Leonhard Euler's Introductio in analysin infinitorum (1748) was mostly responsible for establishing the analytic treatment of trigonometric functions in Europe, also defining them as infinite series and presenting "Euler's formula", as well as near-modern abbreviations (sin., cos., tang., cot., sec., and cosec.). A few functions were common historically, but are now seldom used, such as the chord (crd(θ) = 2 sin(θ/2)), the versine (versin(θ) = 1 − cos(θ) = 2 sin2(θ/2)) (which appeared in the earliest tables), the coversine (coversin(θ) = 1 − sin(θ) = versin(π/2 − θ)), the haversine (haversin(θ) = 1/2versin(θ) = sin2(θ/2)), the exsecant (exsec(θ) = sec(θ) − 1), and the excosecant (excsc(θ) = exsec(π/2 − θ) = csc(θ) − 1). See List of trigonometric identities for more relations between these functions. The word sine derives from Latin sinus, meaning "bend; bay", and more specifically "the hanging fold of the upper part of a toga", "the bosom of a garment", which was chosen as the translation of what was interpreted as the Arabic word jaib, meaning "pocket" or "fold" in the twelfth-century translations of works by Al-Battani and al-Khwārizmī into Medieval Latin. The choice was based on a misreading of the Arabic written form j-y-b (جيب), which itself originated as a transliteration from Sanskrit jīvā, which along with its synonym jyā (the standard Sanskrit term for the sine) translates to "bowstring", being in turn adopted from Ancient Greek χορδή "string". 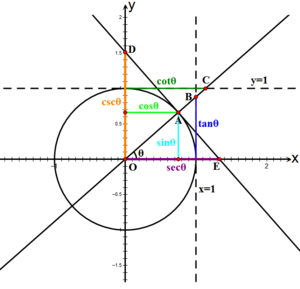 The word tangent comes from Latin tangens meaning "touching", since the line touches the circle of unit radius, whereas secant stems from Latin secans—"cutting"—since the line cuts the circle. ^ Klein, Christian Felix (1924) . Elementarmathematik vom höheren Standpunkt aus: Arithmetik, Algebra, Analysis (in German). 1 (3rd ed.). Berlin: J. Springer. ^ Klein, Christian Felix (2004) . Elementary Mathematics from an Advanced Standpoint: Arithmetic, Algebra, Analysis. Translated by Hedrick, E. R.; Noble, C. A. (Translation of 3rd German ed.). Dover Publications, Inc. / The Macmillan Company. ISBN 978-0-48643480-3. Archived from the original on 2018-02-15. Retrieved 2017-08-13. ^ Bityutskov, V.I. (2011-02-07). "Trigonometric Functions". Encyclopedia of Mathematics. Archived from the original on 2017-12-29. Retrieved 2017-12-29. ^ See Ahlfors, pages 43–44. ^ Aigner, Martin; Ziegler, Günter M. (2000). Proofs from THE BOOK (Second ed.). Springer-Verlag. p. 149. ISBN 978-3-642-00855-9. Archived from the original on 2014-03-08. ^ Kannappan, Palaniappan (2009). Functional Equations and Inequalities with Applications. Springer. ISBN 978-0387894911. ^ However, doing that while maintaining precision is nontrivial, and methods like Gal's accurate tables, Cody and Waite reduction, and Payne and Hanek reduction algorithms can be used. ^ Brent, Richard P. (April 1976). "Fast Multiple-Precision Evaluation of Elementary Functions". J. ACM. 23 (2): 242–251. doi:10.1145/321941.321944. ISSN 0004-5411. ^ a b The Universal Encyclopaedia of Mathematics, Pan Reference Books, 1976, page 529-530. English version George Allen and Unwin, 1964. Translated from the German version Meyers Rechenduden, 1960. ^ Farlow, Stanley J. (1993). Partial differential equations for scientists and engineers (Reprint of Wiley 1982 ed.). Courier Dover Publications. p. 82. ISBN 978-0-486-67620-3. Archived from the original on 2015-03-20. ^ See for example, Folland, Gerald B. (2009). "Convergence and completeness". Fourier Analysis and its Applications (Reprint of Wadsworth & Brooks/Cole 1992 ed.). American Mathematical Society. pp. 77ff. ISBN 978-0-8218-4790-9. Archived from the original on 2015-03-19. ^ a b c Boyer, Carl B. (1991). A History of Mathematics (Second ed.). John Wiley & Sons, Inc. ISBN 0-471-54397-7, p. 210. ^ Gingerich, Owen (1986). "Islamic Astronomy". 254. Scientific American: 74. Archived from the original on 2013-10-19. Retrieved 2010-07-13. ^ O'Connor, J. J.; Robertson, E. F. "Madhava of Sangamagrama". School of Mathematics and Statistics University of St Andrews, Scotland. Archived from the original on 2006-05-14. Retrieved 2007-09-08. ^ "Fincke biography". Archived from the original on 2017-01-07. Retrieved 2017-03-15. ^ Bourbaki, Nicolás (1994). Elements of the History of Mathematics. Springer. ^ The anglicized form is first recorded in 1593 in Thomas Fale's Horologiographia, the Art of Dialling. See Maor (1998), chapter 3, for an earlier etymology crediting Gerard. See Katx, Victor (July 2008). A history of mathematics (3rd ed.). Boston: Pearson. p. 210 (sidebar). ISBN 978-0321387004. See "Clark University". Archived from the original on 2008-06-15. See Maor (1998), chapter 3, regarding the etymology. ^ Gunter, Edmund (1620). Canon triangulorum. ^ Roegel, Denis, ed. (2010-12-06). "A reconstruction of Gunter's Canon triangulorum (1620)" (Research report). HAL. inria-00543938. Archived from the original on 2017-07-28. Retrieved 2017-07-28. Cite error: A list-defined reference named "Needham" is not used in the content (see the help page). O'Connor, J. J., and E. F. Robertson, "Trigonometric functions", MacTutor History of Mathematics archive. (1996). O'Connor, J. J., and E. F. Robertson, "Madhava of Sangamagramma", MacTutor History of Mathematics archive. (2000).